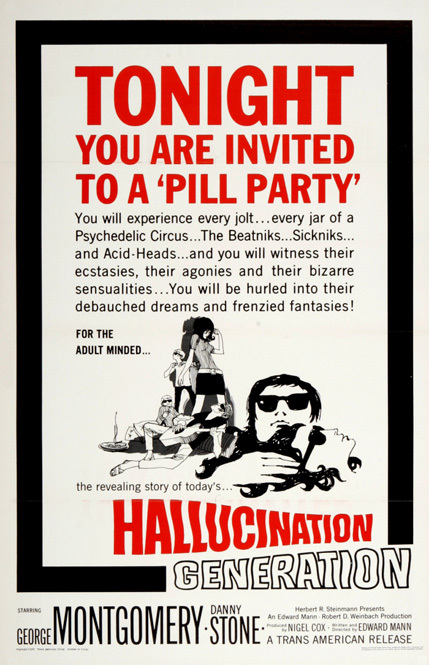 Hallucination Generation (1966, USA) is a Drugsploitation-Hippie film directed by Edward Mann. You will experience every jolt...every jar of a Psychedelic Circus...The Beatniks...Sickniks...and Acid-Heads...and you will witness their ecstasies, their agonies and their bizarre sensualities...You will be hurled into their debauched dreams and frenzied fantasies ! This page was last modified on 18 November 2015, at 15:14.